Here are the best pressure washers for practically any budget. We spent a lot of time reviewing specifications and comparing models. Therefore, we hope that our specially selected list of top pressure washers helps you find the right one for the jobs you need to do. Let’s begin with budget-friendly power washers. These are good for light to medium-duty tasks like washing the car and cleaning a deck. Many of them can strip paint if you need to prepare a surface. Some are powerful enough for cleaning concrete. Most are electric-powered. The Worx Hydroshot is a light-duty surface cleaner. It magnifies the pressure from your garden hose up to eight times. This allows you to clean bikes, boots, tools, and more. Best of all, a flip of the switch lets you go back to watering the lawn. Otherwise, you can supply it with water from a bucket or some other kind of reservoir. The battery-powered pressure washer runs on 20V Worx batteries. These are the same ones that other WORX power tools use. The kit comes with two batteries, a charger, and a turbo nozzle. TACKLIFE’s pressure washer offers 2752 cleaning units of power. It’s easy to manage the pressure with the adjustable nozzle on the spray lance. Plus, it includes a detergent tank. The 20-foot pressure hose and the 35-foot power cord give you significant reach. Moreover, the power cord has GFCI protection. This is essential as you’ll be using an electrical device with water. Next, the trigger has a safety switch. This prevents accidents as the force of water from a pressure washer can cause injuries. Also, when you release the trigger, the pump shuts off. That protects the pump and saves electricity. TACKLIFE also thought of the eventualities. They include extra washers and a gasket to take care of leaks. And they offer a 24-month warranty. 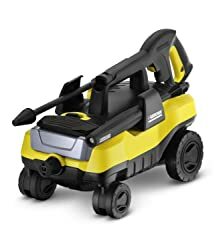 The compact Karcher K3 follows after you on its four wheels. But don’t let its tiny size fool you. It offers 2340 cleaning units of power. Furthermore, it’s a Family Handyman Editor’s Choice pressure washer. It can clean your siding, driveway, and car. This model includes typical features From Karcher like the adjustable Vario Power Spray wand, the Dirtblaster wand, and an onboard detergent tank. There are also several accessories you can buy to extend its capabilities. The Sun Joe SPX1500 and puts out 2766 cleaning units for a variety of jobs like washing your home’s exterior or your SUV. It comes with a 20-foot water hose, a 33-inch wand with adjustable nozzle, plus a 35-foot power cord with GFCI protection. It has a 2-year warranty plus it’s CSA-approved for safety. There’s something to note about Sun Joe pressure washers. They usually come with TSS technology. TSS stands for Trigger Stop System. When you release the trigger, it stops the pump from operating. That extends the pump’s lifetime and saves electricity costs. It’s also a safety feature. The GreenWorks GPW2001 strips paint and removes stains. One of its highlights is the very quiet induction motor. Just as important, it has two detergent tanks. That’s a timesaver that means you can carry two different soaps or a double quantity of a single detergent. The accessories include a 25-foot high-pressure hose and a 35-foot power cord. Instead of an adjustable spray wand, the lance has an assortment of tips to control the pressure. One of them is for foaming detergent. Finally, everything stores on board. It’s easy to transport if you tip it back onto its wheels. Models with at least 3000 cleaning units of power, or over 2000 PSI and 2 GPM are considered medium-duty. Some are electric, but many are gas-powered. Sun Joe’s SPX3000 tackles just about any job you can think of around the house with 3572 cleaning units. (This rating comes from multiplying the PSI by the gallons per minute flow rate.) We wish it had a single adjustable nozzle for convenience, but instead, it comes with a set of quick-connect tips. But there are two detergent tanks, a 20-foot hose, and a 35-foot power cord. Of course, the pressure washer has the Total Stop System to protect the pump in the user. And Sun Joe offers a Two-Year Warranty. The Sun Joe SPX3500 offers 3404 cleaning units. That’s plenty for cleaning driveways, sidewalks, home exteriors, vehicles, and a lot more. This power is due to a durable pump and a brushless induction motor. The induction motor is quiet and runs cool compared to traditional engines. One of its highlights is the adjustable detergent dial for the onboard tank. This nifty control lets you set the right amount of soap for the task. Next, the spray wand comes with five quick-connected spray tips for you to choose the correct pressure. While the 0° nozzle puts out an intense stream that can strip paint, the 40° tip is perfect for rinsing the soap off a car. Karcher’s K5 Premium is a deluxe kit with a detergent tank, a Dirtblaster spray wand, a Vario Power wand with adjustable flow, and a 25-foot hose on an integrated reel. This company makes some of the most-trusted pressure washers in the business. Part of that is due to their pump design and part of it is because of their warranty. The N-COR pump is maintenance-free and it won’t corrode. It’s powered by a water-cooled induction motor. Moreover, Karcher offers a two-year warranty plus their Rapid Exchange Program that sends a replacement if you’re waiting for in-warranty repairs. Many medium-duty and pressure washers run on gas engines. This Simpson Cleaning power washer has a Kohler RH265 OHV motor protected by a two-year warranty. If you have a lot of cleanups to do on a regular basis, a gas pressure washer like this one lets you roam where you need to work. Although it’s noisier and needs more maintenance than an electrical power washer, it also offers a lot of power. In this case, that’s 7440 cleaning units. It strips paint, cleans grease off the barbecue, washes mildew from siding, and takes care of the driveway. The spray wand comes with five nozzle tips to manage the pressure. There’s also a 25-foot abrasion-resistant pressure hose. All these accessories store onboard even though there’s no reel for the hose. Briggs & Stratton made this gas pressure washer with something they call Quiet Sense Technology. What this does is reduce the noise by idling the engine when you release the spray gun trigger. Also interestingly, the Briggs & Stratton engine never requires an oil change. All you have to do is check the level and add more if needed. The package includes four tips, a 30-foot hose, and a detergent tank. Heavy-duty pressure washers start with specs like 3000 PSI and 3GPM. These are what the pros use for professional cleaning services, property maintenance, and restaurant cleanup. The Shark HPB-353007A3 electric power washer has a belt-driven Karcher pump and a diesel heater. It’s especially nice for indoor cleanup of greasy surfaces. That’s because it’s not as noisy and doesn’t create the same amount of fumes as a gas-powered pressure washer. Moreover, this model is more compact than many of its competitors. It has a design similar to a hand truck. And it comes with a one-year warranty on parts, three-year warranty on the coil, and a seven-year warranty on the pump. The Briggs & Stratton 4000 PSI pressure washer is cold water only. There’s no heater. But it has impressive specifications. First, it uses an Annovi Reverberi Triplex Pump for 16,000 cleaning units of power. But you can lower the pressure to a mere 300 PSI for delicate jobs. Additionally, it includes a rugged 50-foot hose and five quick-connect tips. One of the tips is for foaming detergent. Although it’s a commercial model, it also comes with a 24-month consumer warranty. The Dirt Killer H3612 has 14,700 cleaning units of power. That amount of force cleans up graffiti in an instant. But it also works well for washing concrete floors and building exteriors. This pressure washer puts out 3500 psi with a flow rate of 4.2 gallons per minute. Much of its power is due to the Kranzle pump. This pump won’t be damaged if water freezes inside, and it can stay in bypass for hours plus run dry without being damaged. But it’s a Honda GX-LXE 13HP OHV engine with electric start that runs the pressure washer. There’s also a diesel heater for the hot water tank. You can set the temperature high enough to use steam, too. As you shop for the best pressure washer, there’s only one thing to keep in mind. All you need to know is the type of jobs you plan to do with it. Then you’ll know if you want hot water or not, a detergent tank, or other accessories. You also be able to decide how much power you need. We hope that our reviews today helped you find the right pressure washer for all your surface cleaning tasks.